So, how do you follow an act like the release of the iPhone 4? A complete revamp of the iPod line along with a complete rethinking of Apple TV to boot, that’s how. 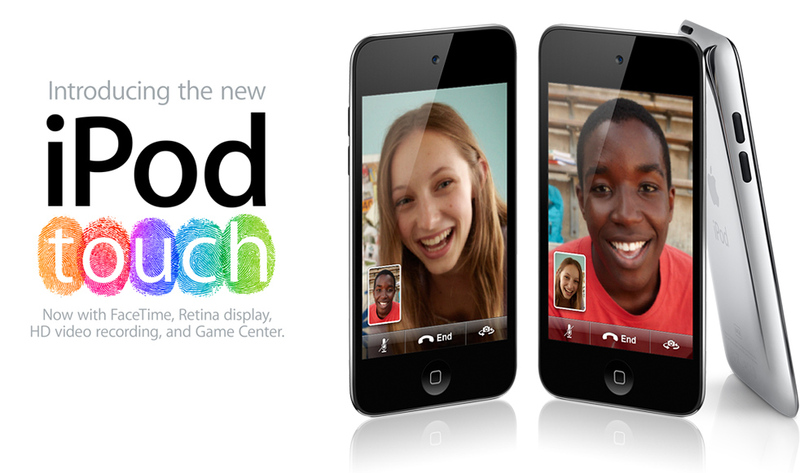 First up… the new iPod Touch. As expected, it’s basically a thinner version of the iPhone 4 minus the phone capabilities with all the bells and whistles that were expected (retina display, hd video, Apple A4 processor) and hoped for (FaceTime). Also, the first major revision to iOS 4, iOS 4.1 with all sorts of goodies that everyone’s been clamoring for like the bluetooth and proximity sensor bug fixes, and, the 3G slowdown-to-a-crawl issue has been addressed as well, and not a moment too soon. Apple has taken quite a hit because of all the glitches 4.0 brought to the table, and I think no one out there can complain about the quickness that these major and minor buggies have been addressed. The Game Center that was touched on when 4.0 was announced is also here with the 4.1 release, as well as an improvement to the camera with HDR photography. In a nutshell, when you take a photo, along with the normal exposure image, 2 other images are snapped in rapid succession, one over exposed and one under exposed, then using some neat mathematical magic, the 3 images are combined into one creating a composite image that has improved contrast. Washed out areas disappear and detail appear in it’s place along with overly dark shaded areas are lightened and more detail again is revealed. HDR is nothing really new, I even had downloaded an app that already did the same thing on my 3G, but the photos it took were so so, and didn’t warrant replacing my standard camera app built into the phone. Hopefully Apple’s version will add more to the awesome new camera. Available in 8, 32 and 64 gig storage capacities and priced at $229, $299, and $399 respectively. 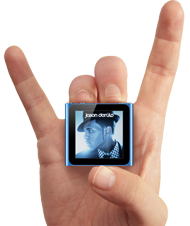 The iPod Nano!! I remember seeing a parody image of a nano sized iPhone dubbed the iPhone Nano… well, Apple took the idea to heart and have completely redesigned the nano adding a multi-touch display, iOS4 driven iPod with a rotatable display, gesture driven device that’s small enough to clip onto your shirt. Jobs sure wasn’t kidding when he said that they renamed iOS4 because they intended on using it on far more devices than a phone, hence, the name change. Well, here it is… obviously everyone expected the iPod Touch to run OS4, but apparently size doesn’t matter when it comes to this truly mobile OS. This feature packed device sports Genius playlists, playlists, arrangeable icons, 24 hr play time, shake to shuffle, a clock, an FM radio with live pause!!! , and is available in 5 different colors and 8 or 16 gig storage capacity. The absolute only thing this little power house is short on is size and weight. Nearly 1/2 in both categories over last year’s model. You can even use it as a pedometer that encourages you along while rockin’ out with you favorite music with the Nike + iPod $29 dollar add on. Instantly recognizable for iPhone/iPod/iPad users, it sports a springboard complete with arrangeable icons that you move… of course, using jiggle mode just like it’s bigger counterparts. Well, almost, only the icon you’re moving actually jiggles, but the operation is identical. 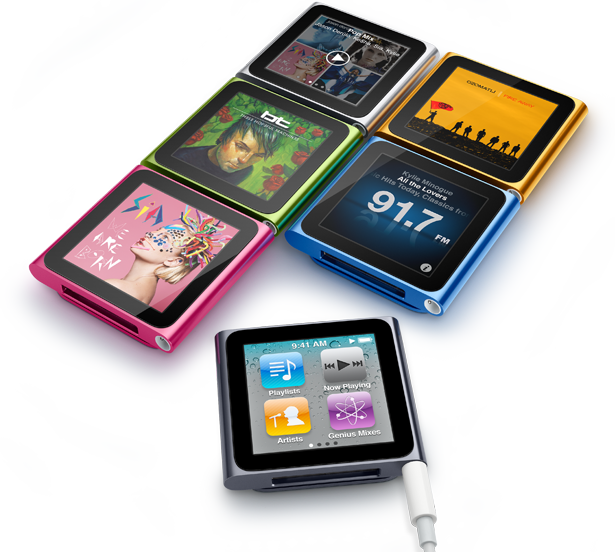 Priced to sell at $149 for the 8 gig or $179 for the 16 gig, the price is low compared to the features stuffed into this nano sized giant of an mp3 player. 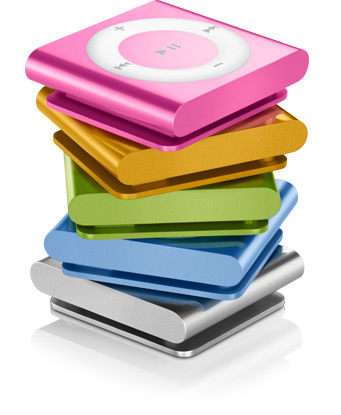 Rounding out the bunch is the iPod Shuffle. Apple research indicated people missed the buttons, so along with voice commands, the all too familiar wheel/button with volume up/down track next/previous is back on the shuffle, along with voice over, the iPod Shuffle packs 15 hours / 2 gig storage into a leek all aluminum, extremely wearable design and priced at just $49, there’s an iPod for every budget. With a complete redesign of the entire iPod line, I think Apple will continue to rule the music player market for quite some time to come. Of course, all these devices are managed by iTunes, and just in time, complete with a redesigned logo, is the 10th major revision with iTunes 10. Since iTunes helped send the audio CD to the chopping block, it’s only fitting that the CD icon be retired for an all new iTunes icon. iTunes sports some efficiency improvements along with the addition of Ping, Apple’s new music centric social networking application built into iTunes on both the desktop and iPhone/iPod Touch versions. Personally, I’m not a huge social networking fan, but if social networking with the Facebook/Twitter crowd is your gig, then Ping will be right up your alley if you’re serious about your music. One of the nicer features is the ability to create an inner circle of friends so if you don’t want to be so public, you can control (quite easily according to Apple… a jab at Facebook I believe), your privacy on any level easily. Lastly is Apple TV. In recent times, many companies, (including Apple), have all taken a stab at a media hub that marries your PC to your high def TV. None (including Apple), have had much success in that area, so Apple did what it always does… it researches the market to find out what people don’t like, not what they do like, and design the product around eliminating the things people hate about a product. 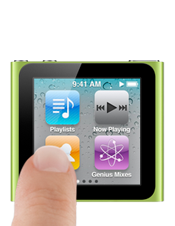 With the iPods, it was eliminating complex design and marrying that with stylistic finish. With the iPhone, again, ease of use was the driving factor (removing complex menus and focusing on ease of use) that drove the iPod line to the top of the heap, and a cold hard look (at user complaints about set top devices) lead to this radical departure from the former Apple TV leading up to this year’s totally re-imagined set top device. With storage management issues as a complaint high on the list, Apple’s unique solution was to eliminate purchasing/downloading and keeping titles to simply renting them. Since you’re renting the prices are cheaper and one is more likely to spend more the less they have to pay. 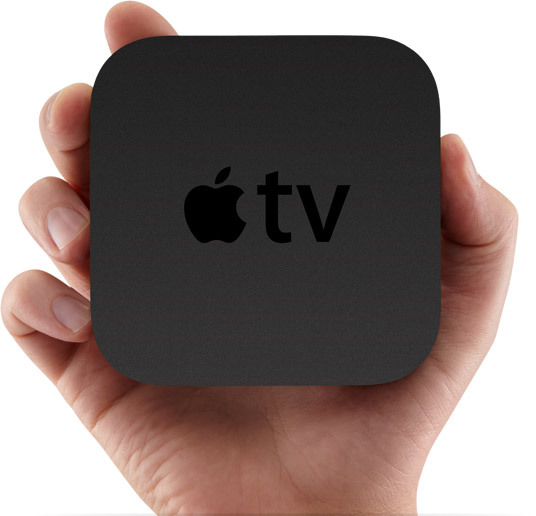 All HD content is another feature people wanted, so all content is now HD only on Apple TV. The set top unit is also smaller, quieter, and couldn’t be easier to setup. Simply power the unit, plug in the hdmi port between the unit and TV and connect to the net via network cable (RJ 45) or WiFi, you’re choice. Besides renting movies or TV shows from Apple TV, Netflix subscribers can stream the online Netflix content to the device as well, and you can also watch YouTube videos or view flikr slideshows complete with music from your iTunes collection, and with the typical home set up having the high end sound system connected to the TV, you can enjoy your best music on your best audio hardware in your home. With the free remote app, you can also control your Apple TV via the iPhone, iPod Touch or iPad, and, even more exciting, you can stream from your iOS device to your HDTV right from the device! Considering the dock connector –> HDMI cable running $40 bucks, Apple TV seems like a steal at $99. I honestly can’t predict how successful Apple TV will be, but if anything in the set top box is going to change things, Apple TV certainly seems to have the biggest chance of making that happen.